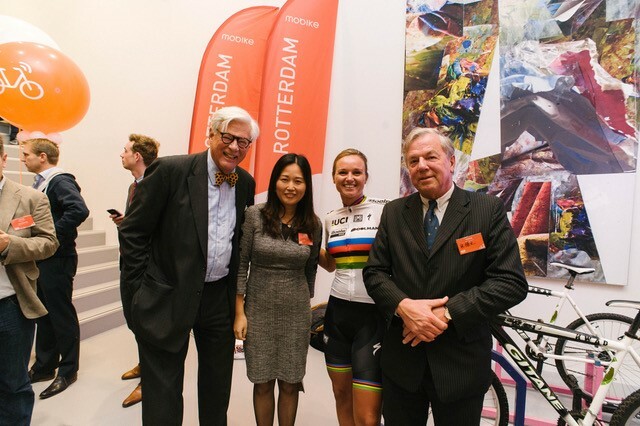 The Chinese supplier of sharing bikes Mobike officially launched its services in Rotterdam on Thursday 16 November. NCBC Chairman Jochum Haakma and board member Boudewijn Poldermans were among the VIP guests. Mobike starts a trial period in Rotterdam with 150 bicycles. If the trial proves a success, more sharing bikes will be added. Users can locate an available Mobike by using an app. Paying and unlocking the bicycle can also done via the app. The bikes are equipped with a GPS tracker, so that the location of the bike can always be determined. Mobike started only a year ago and has, at this moment, around 7 million bicycles in service in countries such as China, Italy, Japan and the United States. Rotterdam is the first Dutch city with Mobikes and the 190 th city globally.